This (8/10/11) is officially out last full day in Prince Edward Island. Dark and early tomorrow morning, we will be headed for home. I’m sure there will be a few stops along the way–perhaps on our way home. 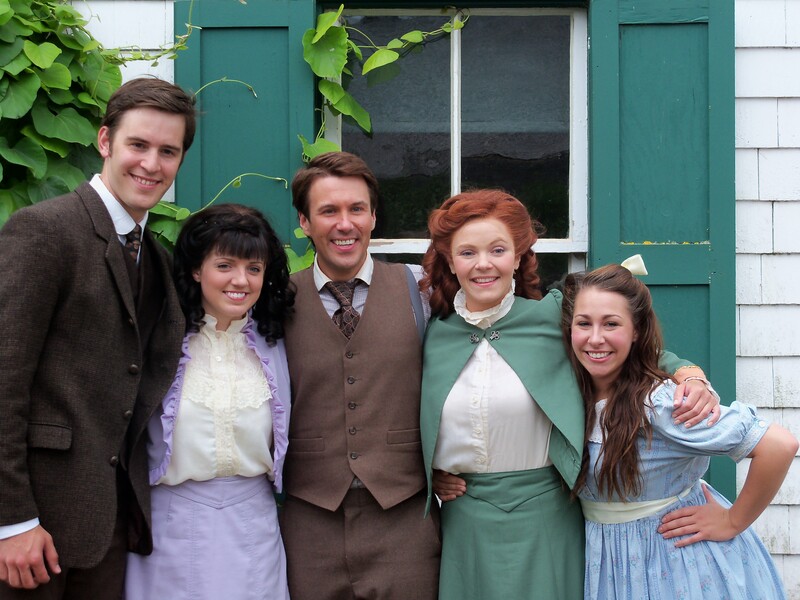 This afternoon, we headed to Green Gables where the cast of Anne and Gilbert performed a few selections from the musical. We packed in the middle of our day before heading out for our last Wednesday Evenings with L.M. Montgomery. On the way, I had learned a few more Montgomery sites from my recently purchased guide book, so we decided to check some out. We were going to head to Belmont which boasted the Belmont school where Montgomery taught and two privately owned houses where she boarded, but when we were running short on time, we decided to forego it. 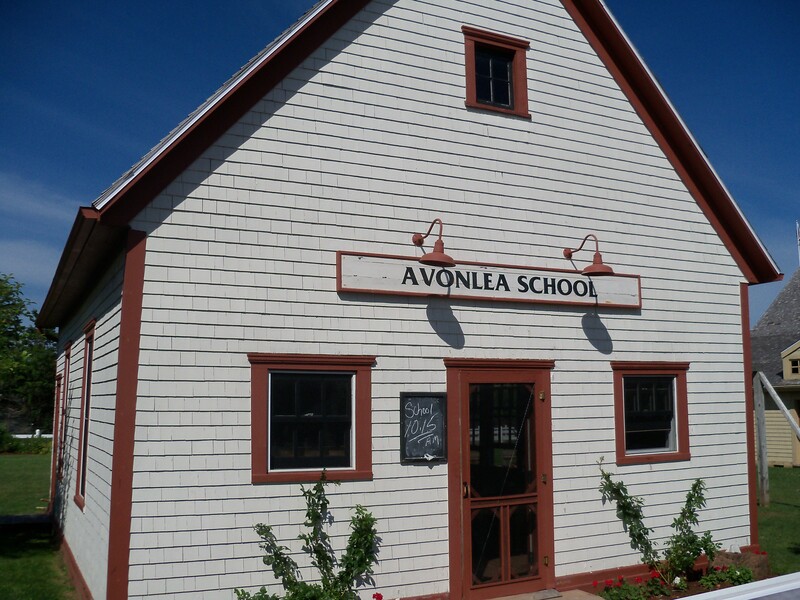 Also, we remembered that we had seen the Belmont school in Avonlea Village, so the picture in the guidebook was taken before the move. We did, however, find the location of the Bideford school. 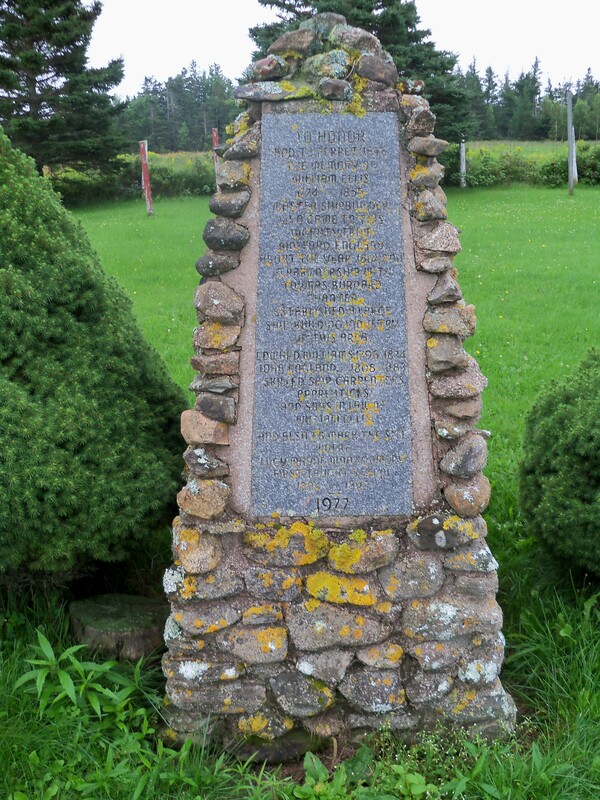 It had been destroyed long ago, but they had erected a monument there to commemorate the place. Now, it is in the middle of a small community park. The location contains the monument, one stone chair?, an old outhouse, the remains of a pump, and one small picnic table. Just down the road from the Bideford Parsonage Museum, the site makes it easy to imagine Montgomery walking the path to and from school every day. We took the road from the school back to the Bideford Parsonage Museum. The Wednesday Evenings with L.M. Montgomery meeting was a treat as usual. The hostess began by reading some selections from Montgomery’s journals in which she discussed both the writing of The Story Girl and when she received the published copy seven months later. She mourns the fact that both her grandmother and (Someone else–they said at the meeting it was her cousin Frederica, but she died in 1919–8 years later) couldn’t read the story and wonders if she’ll ever write again. Thankfully, she did. We then read a selection of The Story Girl: Two chapters, which were “A Dread Prophecy” and “Judgment Sunday.” They were lots of fun to perform–at least for our family who captured the principle roles of Beverly King/Narrator (Me), The Story Girl (Abby), Cecily King (Halla), and Aunt Janet (Mom). It was another delightful evening, and a bittersweet one. 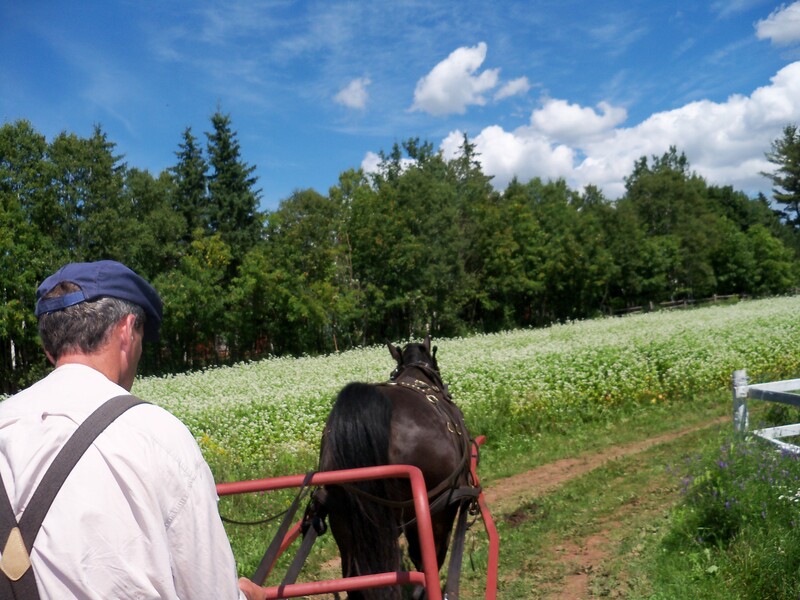 We have truly enjoyed learning and reading together in this small community of enthusiasts, and we will sorely miss being here–especially as next week will be a special presentation by Christina Wyss Eriksson, author of The Anne of Green Gables Treasury. (Robert Montgomery had recommended for us to meet her.) We have dearly loved our time on PEI, and it will be interesting to see how this project continues to unfold. Thanks to all who have come along for the ride. It will continue–though not daily, as I can no longer afford to be up til 1-2 every evening assembling my day’s adventures. I will continue to post poems of Montgomery’s, as well as Robert Bolling’s, with some of the pictures I took to illustrate them. Additionally, I plan to visit Ontario over Fall Break to pick up that piece of Montgomery’s life. In the meantime, I will continue to post the various and sundry people who have left a legacy worth hunting for–wherever I find them to be lurking. Having just procured a guidebook of important “Anne” places (albeit one published in 1998), we decided to set out today in search of “Anne’s House of Dreams.” It actually is not a Lucy Maud Montgomery site, but the guidebook described the loving care the owner had taken to decorate it like Anne and Gilbert’s house, and had even gone to the trouble of reconstructing the Avonlea School House. I was anticipating a fun “off the beaten tourism path,” but got nothing of the sort. We arrived at a run-down building next to a golf course. “Surely not…” I went into the golf store to ask. The woman running the store informed me that the house hadn’t been open for a long time, and that all the furnishings were gone. I asked whether she thought I should inquire of the people there and take pictures. She very firmly told me, “No. There’s nothing there.” Her firmness interested me (As did the fact that she claimed there had never been a tea room there (Something else the guidebook said), while the sign for the golf club boasted “Tea Room” on the back. ), but I decided not to pry (this once). Besides, she could see me from the window if I walked over. So, instead, we pulled down the street, took a few pictures (out of sight of her window), then headed off. 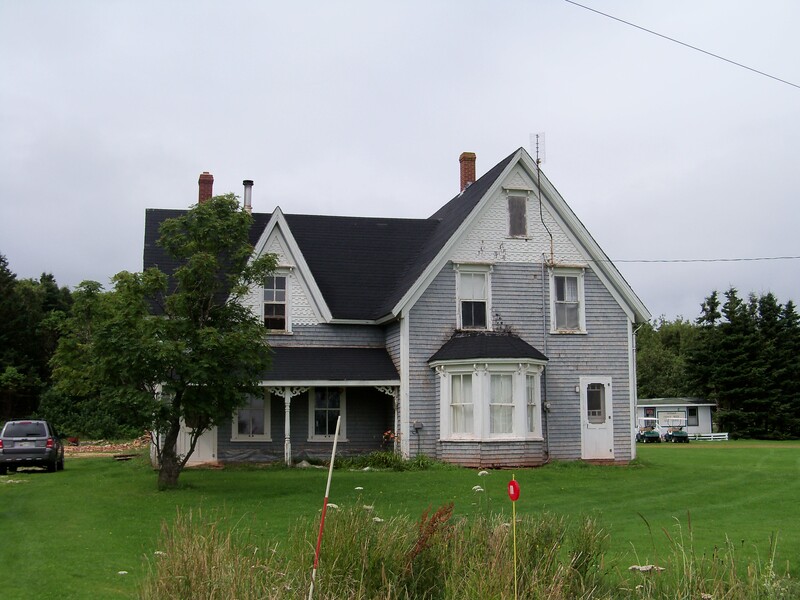 With “Anne’s House of Dreams” dashed, we went back out to Lower Bedeque to investigate the school house. The guidebook explained that the house where Montgomery boarded was near the school house, and on our previous trip, we hadn’t been able to go inside. The museum was very fascinating. It was an amazing example of the love of a community and other countries. The school house had been completely dilapidated with walls falling in. The community decided it’s legacy should be preserved, so they undertook working on it. 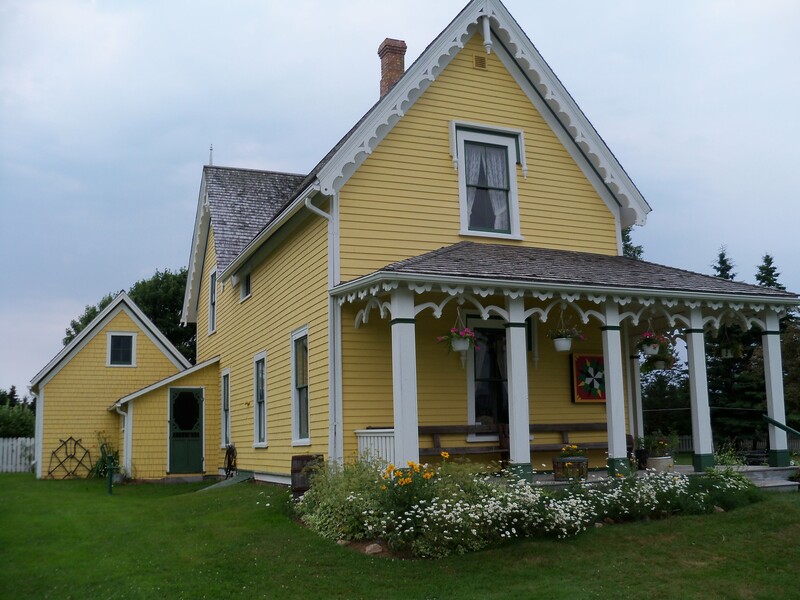 Somehow, the plight became known to Montgomery fans from Japan (who incidentally have been a major support to every place “Anne” related–There’s even a room in the Anne of Green Gables Museum dedicated to the contributions of the Japanese.) A pair of sisters from Japan involved their community group and ended up raising thousands of dollars to help restore the schoolhouse. 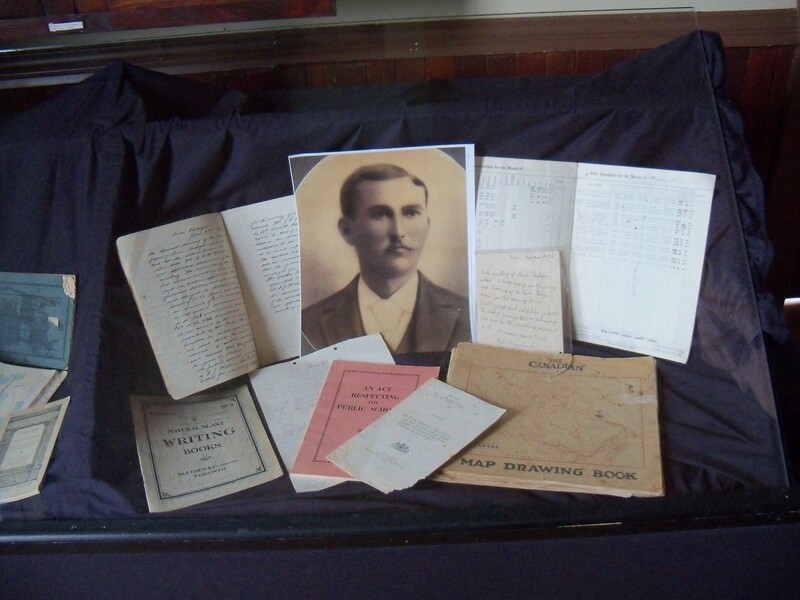 Their correspondence is on display at the museum. 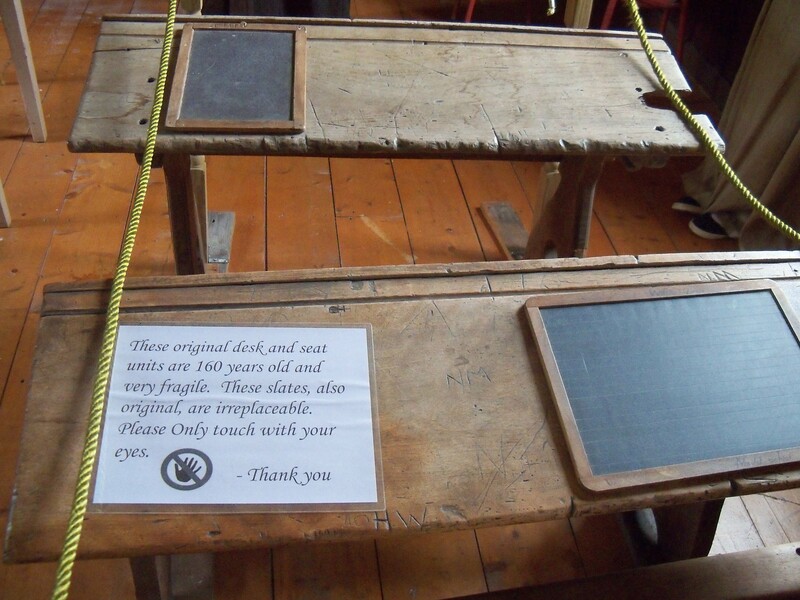 The museum also contains costumes worn in the “Anne of Green Gables Musical,” a list of teachers who taught at the school (including Montgomery), and original desks and slates. The staff was incredibly friendly and helpful. Additionally, it is one of the free (donation based) museums. The staff directed us to the home where L.M. Montgomery boarded, but informed us it was family owned, so we could take pictures but not disturb them. 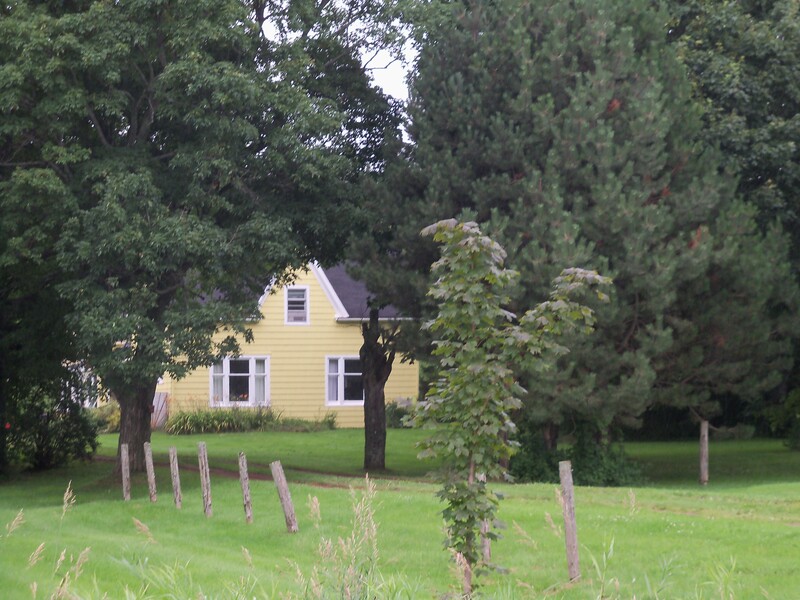 From what they shared, it seemed like the house was owned by the Leard’s. Lucy Maud Montgomery boarded with them and fell in love with their son Herman, breaking off her engagement because of him. By Maud’s account, she never could have married him because he was “beneath her.” According to the staff of Lower Bedeque, the Leard’s story was that Maud threw herself at him, and he was engaged to someone else and indifferent to her. They shared that Montgomery stated in one of her journals that “He would never love her as she loved him.” It was interesting though–wish I could hear that story first hand. But, there was another name of the mailbox, so we decided to continue on. Leard House viewed from the road. We had found a coupon for free tickets to Anne and Gilbert: The Musical, and since it was the girls’ favorite and they had begged to see it again, we decided to do so. As we were sitting in the parking lot eating dinner, four of the cast members drove in. My nieces were beside themselves, so we went to get a program for people to autograph and waited for them to reappear. 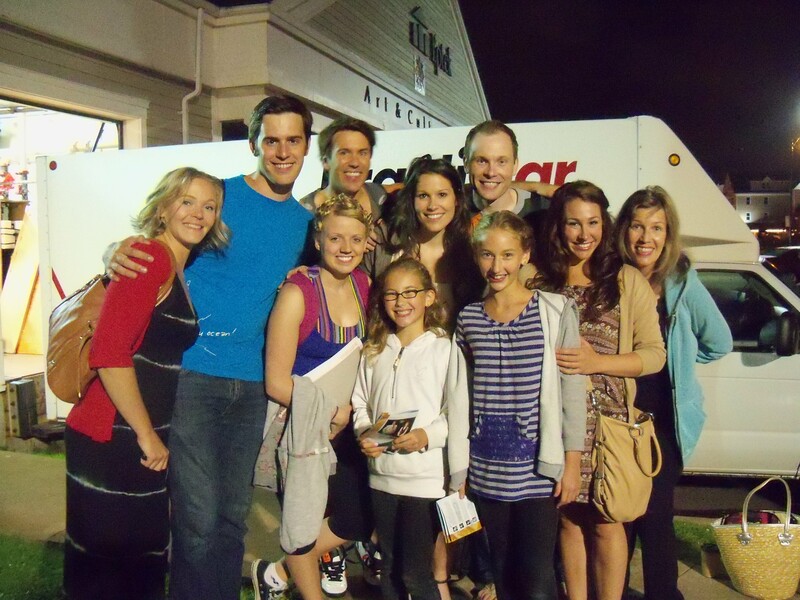 One of the actresses we talked to told us where to wait after the show to meet the cast. The musical was incredible again, and after the show, we headed to the designated spot. The cast was all amazingly kind, signing both girls programs. I’m not sure how many “repeat attenders” they get, but they were thrilled that the girls loved the play enough to see it twice in a week’s time. They also told us that they will be performing a few songs from the play tomorrow at Green Gables, which is right across the street from us. So, in addition to packing the car to go home and the Wednesdays with L.M. Montgomery, we’ll have something fun to do.